A few thousand interceptors at home and abroad would significantly strengthen deterrence, not undermine it. Russia has, over the past six years, repeatedly threatened the use of nuclear weapons against U.S. allies and NATO, as well as a new threat on April 2, if the U.S. armed Ukraine or protected the Baltic states. The Russian ambassador to Denmark recently threatened to aim Russian nuclear warheads at Danish warships if they deployed missile defense radars. Such dangers will only be magnified if the number of nuclear powers multiplies, such as if Iran and Sunni states develop nuclear weapons. Iran's Foreign Minister has said that Iran plans to sell "enriched uranium" on the international market, and will be "hopefully making some money" from it. Such rogue threats might also involve surreptitious missile launches, such as from freighters or submarines, where the state of origin could not be readily identified. A more serious threat is North Korea's ability to miniaturize a nuclear warhead, allowing it to be placed on a wider range of missile types. "The threat continues to grow..." — Admiral James Syring, Director, Missile Defense Agency, March 25, 2015. Congress is now wrestling with the extent to which the U.S. should fix, modernize and expand its missile defenses, including better protecting the American homeland as well as its forces and allies in Europe, Asia and the Middle East. In particular, this effort would include, but not be limited to: (a) building a third, U.S.-based, missile-defense site; (b) adding14 more interceptors to the two current sites and 30 interceptors now in California and Alaska; (c) completing phases two and three of the European-based Phased Adaptive Approach, (EPAA), designed to meet the threat of Iranian missiles to the U.S. and Europe; (d) adding to the inventory of current interceptors, including the Patriot, the Terminal High Altitude Air Defense (THAAD) and Standard Missiles to protect the Middle East and Asia; and (e) funding new technologies for future missile defenses. Since the advent of the Strategic Defense Initiative (SDI) in March 1983, critics of missile defense have often successfully scaled back planned missile defenses as well as future technology developments (such as directed energy weapons and space based systems), even as they criticize missile defense for lacking sufficient robustness. To overcome this perpetual roadblock, and to make sufficient progress toward better protecting the homeland of the U.S. and its allies, the nature of the missile defense debate in Congress needs to change in two fundamental ways. First, the U.S. and its allies must stop arbitrarily limiting the technology sought to field missile defenses. That change would free American and allied ingenuity to develop better technologies for missile defenses, without artificial barriers. Too often and for too long, ill-informed persons have complained misguidedly that, for example, as "we cannot weaponize space," that is sufficient reason to preclude the development of missile defenses including space-based sensors and interceptors. Second, the U.S. and its allies would do well to distinguish between two distinct missile defense missions. Traditionally, U.S. theater missile defenses protect U.S. military forces overseas by significantly blunting any attack on U.S. military forces, thus either deterring such a strike in the first place or allowing U.S. forces to operate more effectively. Equally important, however, is the role of missile defenses in defending the American homeland from missile attacks. Unfortunately, critics have long argued that given the large size of the Russian and Chinese arsenals of long-range ballistic missiles and nuclear warheads, no American missile defense can be sufficiently effective to protect the U.S. from such a major threat. This view has usually been coupled with the contradictory idea that U.S. missile defenses, to protect the American people, have to be so limited as not to worry Russia (or China for that matter). Critics, including the Russian and Chinese governments, argue that U.S. missile defenses, if "too big," would "interfere" with the deterrent capabilities of its adversaries. In other words, critics argue simultaneously that American missile defenses can never be sufficiently robust to deal with the large arsenals of the Russians and Chinese, but also argue that if "too robust," they will upset the Russians and Chinese to the point that Moscow and Beijing will "forced" to increase their arsenals aimed at the U.S., to overcome U.S. defenses. One critic has gone so far as to say that American missile defenses, far from being purely a defensive measure, are in fact an aggressive attempt to bully our adversaries. He claims that U.S. policy is to develop "first the shield and then the sword." In short, the U.S. was being condemned for defending itself. Contrary to the critics' arguments, an American missile defense inventory of a few thousand interceptors, deployed in a variety of modes at home and abroad, would significantly strengthen deterrence, not undermine it. A critically worrisome factor today between the United States on the one hand and China and Russia on the other, is that a crisis over Ukraine or the South China Sea could evolve into an open military conflict between the nuclear powers. In this context, Russia raises the prospect that nuclear-armed missiles might be used, especially in light of Russian President Vladimir Putin's assertion that he seriously considered using nuclear weapons if he were challenged militarily when invading the Crimea and Eastern Ukraine. This statement came on top of serial Russian threats, over the past six years, to use nuclear weapons against U.S. allies and NATO, as well as a new threat on April 2, 2015. On that date, Russian generals threatened a "spectrum of responses from nuclear to non-military" if the U.S. armed Ukraine or protected the Baltic states. Such dangers will only be magnified if the number of nuclear powers multiplies, such as if Iran and Sunni states develop nuclear weapons. Iran's Foreign Minister, Mohammad Javad Zarif, has already said that Iran plans to sell "enriched uranium" on the international market, and will be "hopefully making some money" from it. How interesting. Wonder to whom? Nuclear missile strikes by Russia against NATO or the United States would in all likelihood be aimed at the military capability of U.S. and that of its allies. The Russian ambassador to Denmark recently threatened to aim Russian nuclear warheads at Danish warships if they deployed missile defense radars. In such cases, robust missile defenses deployed by the U.S., NATO and Western friends and allies could seriously complicate Moscow's war aims, making it more difficult for Russia to feel confident that it could achieve its objectives. In short, the U.S. could increase the Kremlin's uncertainty -- thereby strengthening deterrence. On the other hand, robust missile defenses, whether deployed in Europe or in America, would also have a critical role in dealing with missile attacks aimed at America's and allied population centers. NATO in 2010 formally strengthened its goal of protecting its military forces and assets, by adding the protection of its civilian populations as a central role of missile defenses in Europe. Currently, missile threats to U.S. population centers come largely from rogue states such as North Korea, Syria and Iran; they could eventually come from terrorist organizations acting on behalf of such rogue states. Additionally, such rogue threats might also involve surreptitious missile launches, where the state of origin could not be readily identified. Such missile launches might very well come from submarines, which U.S. adversaries surely see as being a particularly daunting challenge for the U.S., given the vast maritime territory it has to defend along its 12,000 miles of coastline. There, our missile defense needs to be of an extremely high capability. Any deployed missile defense must be able to shoot down any ballistic missiles and nuclear warheads, from rogue states or anyone else, by intercepting such "limited attacks." If deployed properly, U.S. missile defenses can get multiple shots at an incoming warhead, making the capability of combined or multiple interceptors better than stand-alone interceptors. In this way, the likelihood of being able to shoot down a small number of rogue state or terrorist-launched missiles against the United States approaches 100%. To date, North Korea has a limited, though dangerous, nuclear arsenal. A more serious threat is North Korea's ability to miniaturize a nuclear warhead, allowing it to be placed on a wider range of missile types and thus expanding the North Korean missile threat -- such as shorter-range missiles launched from an ocean-going freighter. If Iran joins the nuclear club, its warhead inventory might also initially be limited, but only for a short time; the dangers to the U.S. thereafter would markedly increase. Thus, the development of missile defenses and sensors capable of finding and shooting down such missiles early in their flight is paramount. A benefit is that such a capability would reduce quite significantly the area that the United States must defend. Such interceptors could be space- or sea-based, combining Navy assets deployed on land, known as "Navy Ashore" (a system now deployed in Romania, for example). He further noted that, according to the Defense Intelligence Agency, Iran "is capable of flight-testing an ICBM in 2015." He continued, "Iran has publicly stated it intends to launch a space launch vehicle as early as this year  that could be capable of intercontinental ballistic missile ranges if configured as such... Iran could threaten maritime activity throughout the Persian Gulf and Strait of Hormuz." On North Korea, the Admiral warned, "In addition to the Taepo Dong 2 space launch vehicle/ICBM, [capable of striking the continental United States] North Korea is developing and has paraded the KN08 road-mobile ICBM and an intermediate-range ballistic missile [IRBM]." The significance of these developments is that a road-mobile missile is far more difficult to strike before launch, as it can deploy in a much larger area than a fixed, silo-based missile. As for the new IRBM, it also expands the threats the US and its allies are now facing from North Korea. Given such growing missile threats on America's horizon, the task of building more robust missile defenses would seem to be a "no-brainer." Polls show the American people overwhelmingly support such missile defenses, and a large majority supports greater defense spending -- a welcome switch from just a year ago. Congress should approve the Administration's missile defense budget request, especially for adding to our inventory of missiles, as well as sensors and satellites. Critical also will be to add funding for the development of new technologies to provide for the future defense -- at the very least from these well-identified increasing threats -- of the U.S. and its allies. It is an investment we need to make. Testimony of Vice Admiral James D. Syring, Director, Missile Defense Agency, March 25, 2015 before the Senate Armed Services Committee. Joe Cirincione, Newsweek, "The First Star Wars", February 21, 1999. "The Future of Missile Defense", A NATO Perspective, January 15, 2014. "EPAA and Aegis Ashore," October 14, 2014, Defense Daily. I agree with this assessment. And anyone who has followed current events over the past 6-7 years would likely agree as well. The Obama Administration's lack of resolve in pretty much ANY foreign policy issue has directly led to where we are today. The greatest dangers in my mind are Iran and Russia. Interestingly enough, I believe those two countries are linked by nuclear technology, and as such are the real reason we see oil prices as low as they are. The Saudis have no wish to see a nuclear-armed Iran on their doorstep challenging for dominance in the Middle East. It needs to be said, promoted, and repeatedly stated...the obvious...that a missile defense system cannot shoot down ballistic missiles that are not fired in a war that never starts. A missile defense system works only against a nation that is bent on using (or threatening to use) its nuclear or chemical missile assets to prevent a nation (ours) from interfering in a conventional war of aggression against Ukraine, or to regain lost states from the prior Soviet Union. For the Russians to threaten nations that choose to develop and deploy a missile defense system is a sure sign that it is what they want to do, to retake small independent nations that were once part of the USSR. But what use is the land you want to regain if you just nuked it? A missie defense assures that any attacks will stay conventional, and therefore reduces the likelihood of it occurring. Russia overstates it's threats to bully the West into submission by means of their determination to not let the US aid NATO in a strong defensive posture. 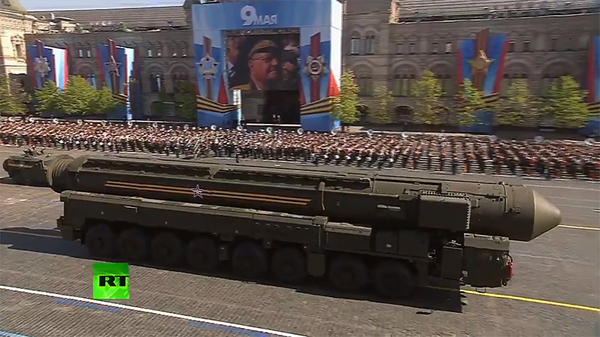 Most likely, the Russian threat involves missiles of relatively short range that are hard to defend. So the Russians could be assured that an ABM defense is not quite a threat to them unless they choose to think of it as just that, because they do indeed have intentions to attack. Put in the AB missiles with the clear understanding that they are to defend against longer range ICBM from rogue nations, not the shorter battlefield nukes Russia might use..
Peter Huessy has nailed the issue again. For the record, I have no current business dealings in the BMD sector. What I do have is over 40 years in the ICBM/BMD Countermeasures business, and I can attest to the fact that an effective BMD system seriously complicates the offense's targeting job, reducing its probability of a successful attack and, therefore, increasing the survivability and deterrence value of the strategic forces.